Coffee beans decaffeinated by the all natural Swiss Water process. This coffee bean is a full bodied quality Colombian coffee coffee bean. It's also Rainforest Alliance certified and Organic. Keeping the full coffee taste, without the caffeine . 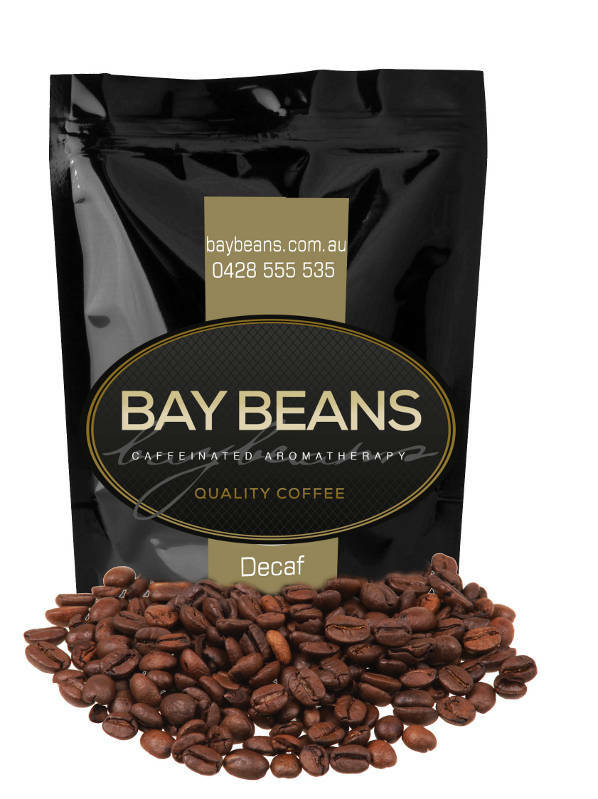 Bay Beans Decaf coffee beans are roasted fresh the day you place your order. 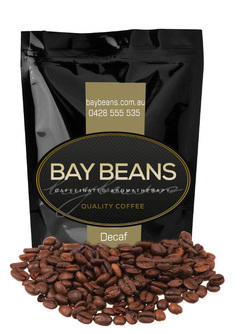 Bay Beans coffee is packed in one-way valve, foil lined bags for ultimate freshness. Buy Decaf coffee beans. OMG I am so happy with the decaf coffee from Bay Beans. It is so delicious, I had to check the pack a couple of times to check it was decaf because i really couldnt tell... and I am a fussy coffee drinker. Great coffee and great service from James. I'm hooked! ​I've ordered from Bay Beans about 5 times and their coffee + free postage + fast delivery is amazing. Their Decaf is the best I've ever tasted. :) Keep it up! I am a very happy customer. ​I've been searching for a decent decaf that tastes like real coffee, I've found it!! Full flavour with a strong depth. I Love it so much just have dropped the milk completely. This Decaf is the best decaf in Australia! I love a bold decaf and had been unable to find one anywhere in Australia that is so deliciously strong in flavour until now – I can’t even tell that it has been decaffeinated. This coffee is like gold to me. The best decaf in Australia - I've never tasted such a well rounded strong decaf coffee like this in any cafe. I no longer go out for coffee! ​Great Decaf coffee, delivered regularly and never a problem. Many thanks. ​The best decaf beans around and awesome consistent customer service. Keep up the good work James! Bloody great stuff this Decaf Whole Bean coffee. P&J Meier, Peterborough South Australia. Great service and great tasting decaf coffee beans. Lots of flavour. I'm very happy with your service and quality. Being trying for ages to get good tasting decafe bean and yours are the best I've ever tried. Just a quick note to say thank you for sending the coffee so promptly. It arrived this morning, literally as I was about to go and get myself a coffee, so I was thrilled to be able to try it out, and it was delicious and I felt very good about still obeying my doctor's orders of no caffeine! Lovely taste,aroma and just right. The best I have bought and I've tried so many! My decaf beans arrived today and OMG, they are the best!!! I've had so many disappointments with decaf in the past (with other brands) that I was cynical towards it. My husband drinks regular and is keen to try your beans now. He's got a brand new Rancilio espresso machine and grinder and is searching for the perfect bean and grind.Thanks for the ebook too. We'll check it out. I'll place more orders online today!! Thanks for the great coffee. We tried out your Decaf beans. So good we bought a second grinder just for them. Our neighbour now constantly wanders across for a decaf coffee as he reckons ours is better than any he's had cafes. Fortunately, he's a nice neighbour! Thanks again for the great coffee beans. Cheers. THANKS!!! Package came in on Saturday - our last flight for the year!! Enough to get me through to when I leave in April im sure! One of the other chef's here has lived in India, so we're smashing the chai tea, and your blend is REALLY nice! There was a scientist here who doesn't drink caffeine either, so I shared the decaf love with her - she was most impressed also.. getting the word out for you.. rock on. thanks again for the easy and FAST transactions! _Superb flavour, price and service! Have tried every decaf on the market (doctors orders) and Bay Beans blows them all away. You have a new loyal customer. Just got my coffee beans in the mail this morning. All I can say is where have you bean all my life, That was the best coffee I have had. Delivery was so fast. Your coffee is absolutely delicious. Awesome. Will never go back to my old coffee beans. Hi James, Just wanted to let you know I received my coffee beans package today and it's mouth-watering! Thank you for an excellent cuppa! Have a fantastic weekend! Really enjoying the decaf coffee beans that baybeans sent out. Medium roast, bright, works with or without milk. Recommended. Submit your own review of Bay Beans Decaf coffee beans.